The third edition of HarvestPlus’ Nutritious Food Fair (NFF) is all set for 28‒30 November with the theme: “Scaling-up nutritious food choices: Engaging everyone, everywhere”. 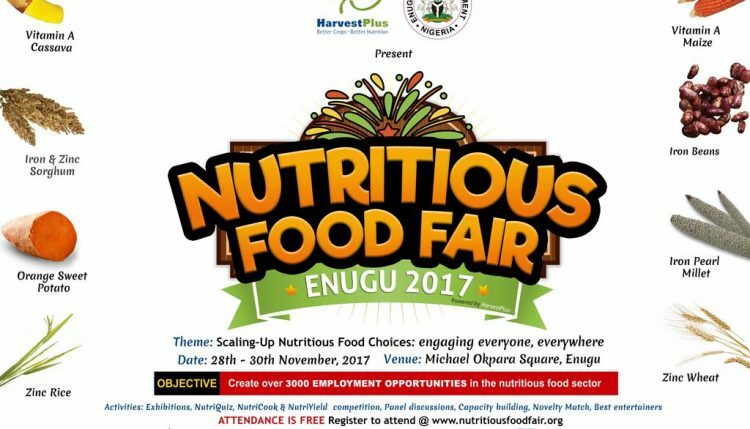 This edition of the Nutritious Food Fair is a partnership with the Enugu State SME, the Federal Ministries of Agriculture, Health, Education, Budget and the Planning Centre. It will take place at Michael Okpara Square, Enugu. 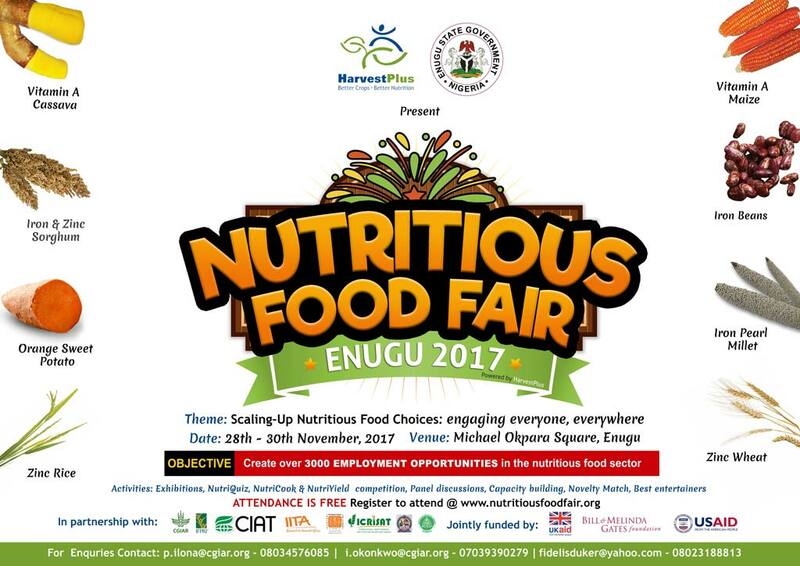 The Nutritious Food Fair, Enugu State from 28 to 30 November 2017. The NFF was conceived as an umbrella advocacy and enterprise platform and aims to drive the production, marketing, and consumption of nutritious food in Nigeria. “Today’s food is highly essential for tomorrow’s growth and we must begin to connect the dots between food, health, and GDP for Nigeria,” said Paul Ilona, Country Manager for HarvestPlus. At the food fair, which will host over 10,000 participants, nutritious food products will be displayed by participants who will get to build up entrepreneurial skills and linkages, identify and network with new partners, discuss new brands to boost marketing, and participate in competitions targeted at promoting the consumption of nutritious foods by Nigerians. Participants will include farmers, processors, marketers, and consumers of nutritious foods as well as food industries, seed companies, input dealers, research institutions, and students. Among many objectives, the NFF will increase the production, value addition, marketing, and consumption of foods made from biofortified staple crops such as vitamin A cassava, vitamin A maize, orange sweetpotato, and iron and zinc sorghum, in addition to creating 3000 new job opportunities in the nutritious food sector. The Food Fair has become an annual flagship event of HarvestPlus Nigeria and one that many people nationwide anticipate. Consumers will get to experience a world of nutritious food and drink options, traditional and masquerade dances, and special events such as the grand finale with the NutriQuiz competition for secondary schools, the NutriYield competition for farmers, and NutriCook competition for caterers. The largest, nutritious cassava dish in the world will be unveiled for the Guinness World Records and a new platform for women called “Smart Mother” will be launched to give women a voice in nutrition.